So if you are anything like me you will be a little sick of seeing the same Microsoft blue everywhere you look. Don’t despair I just worked out how to change the appearance (i.e. 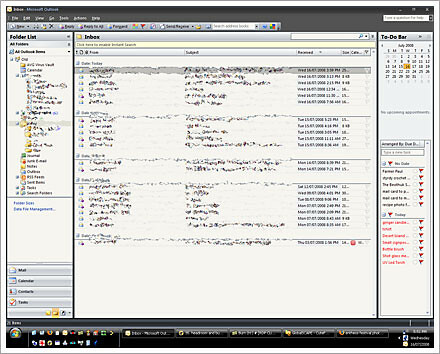 Skin) of Outlook 2007. It is actually very easy but not obvious – probably why I only discovered it today. Now you can choose a nice black theme to match your Vista Transformation Pack or Nasa Night Launch theme for Firefox. That rocks! Open Outlook and there you go – nice dark Outlook! Great to know (also not just an appointment, also a message)! Thanks for adding that. I just hadn’t noticed that the editor was a different menu than the main Outlook menu, one that includes the color options. OP – Thanks for the tip! wow, thats nice – i hv a cute black outlook matchingmy desktop theme. But can I on any way switch the yellow color in the Outlook today to a black one? I hear you brother. Black is the new… everything. It is sad that only 3 color options are available. Why can’t Office just inherit the global Windows settings? Why does it insist on it’s own frickin’ styling. I don’t like Aero. I can change the settings for Windows to something a little more conventional, but Office insists on using that Aero look whether or not I want it or not. So all windows are the same except those of Office. Incredibly arrogant of Microsoft (or at least the Office developers). 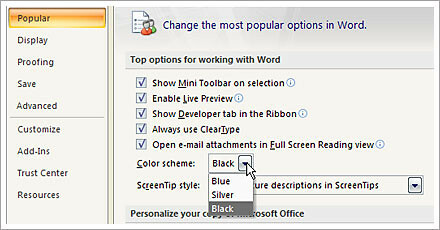 you don’t need to open word, just create a new email and click the outlook start (upper left icon). I think going to a free alternative might be better then Office 2007.. I seen this article http://www.technobuzz.net/5-free-office-suites-for-your-pc/ anyone try any of these? Oh that is so cool. Thanks. Just changed it to black, looks great!!!!!!! Nice tip. Looks great. Thanks for your time in finding this trick and publishing it for the benefit of others. I was going to move everything to change the look. i used silver in word and saw no improvement/change in outlook- still 3d bordello pinball machine look.. the black is the ticket!!! Go into word to change Outlook, I never would’ve thought of that. Thanks for posting! But I want green! Why do they limit it to Blue, Silver, and Black. So why did they make it so you have to go through WORD to get to OUTLOOK?? ?